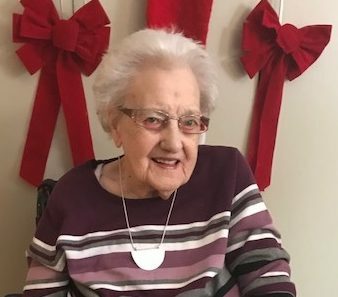 Passed peacefully away on October 8, 2018 at the Agnes Pratt Home in the presence of her loving family, Edith May Dwyer, age 100 years. Predeceased by her parents Stephen and Leah Piercey, husband Harry Dwyer, son Roy Dwyer and daughter Phyllis Schwerdtfeger, 2 brothers Hayward and Herbert, 4 sisters Sadie, Bertha, Maude and Emily. Left with fond and loving memories her children John Dwyer (Clare), Louise Clancey (Doug), Diane Walsh (James), Lynda Trelegan (Thomas, deceased) and Dennis Dwyer, daughter-in-law Irene Dwyer, as well as 18 grandchildren, 29 great grandchildren, 3 great great grandchildren, 2 step great grandchildren and 3 step great great grandchildren. Special thanks to the staff of Pratt Place at the Agnes Pratt Home and her 2 granddaughters Debbie and Wanda for all their extra love and care they have shown their grandmother over the years. Cremation has taken place. Relatives and friends may visit the family at Carnell’s Funeral Home, 329 Freshwater Road on Thursday, October 11, 2018 from 2 – 4 and 7 – 9 pm. Funeral service will be held at the Carnell Memorial Chapel on Friday, October 12, 2018 at 2:00 pm. Interment to follow at Mount Pleasant Cemetery. No flowers by request. Donations in her memory may be made to the Avalon Dragon Boating Inc. in support of Breast Cancer Survivors or by visiting their website at www.avalondragons.com. with you all at this time. It is always difficult to lose a loved one even when you know they have lived a long and fruitful life. Our thoughts and prayers are with you at this time. To the Dwyer and extended family. Please accept my prayers & thoughts to you all during this time. She was a very special lady. Louise, Doug & family so sorry to hear of your mom’s passing. She had a wonderful life living to be 100 & a centurion. I lost my mom on Sept. 17th, she was 92, 8 mos. Still hard to believe that she’s gone. So sorry to hear of th,e passing of your mother. The family of Marjorie Pike (Agnes Pratt Home). Sincere condolences to the family and friends of Mrs. Dwyer. I had the pleasure of meeting her many years ago through her granddaughter Lynn. Thinking of you all at this time. Sincere condolences to the family of Mrs. Dwyer. I was her boarder back in the 1950’s. She was a very pleasant lady I have not forgotten. May you know you are in our thoughts and prayers. To the family……we were so sorry to hear about Aunt Edith’s passing. You all have a special angel to watch over you and she have left you all with precious memories to help you through the days ahead. Thinking about you all during this difficult time. Keeping you all in our thoughts and prayers.